Avista Corp. generates hydroelectrical power in the Pacific Northwest. As part of this effort, the company must monitor the total dissolved gas above and below the generating facilities in the dams. 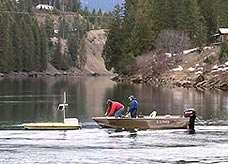 The company contracted with Electronic Data Solutions to provide, integrate, and install monitoring systems for three systems on the Clark Fork River in western Montana. Key elements in the systems are the Campbell Scientific CR510 datalogger, a high-quality barometric sensor, and a water-quality probe with a total dissolved gas sensor manufactured by Alpha Designs. Data are retrieved over a spread-spectrum radio link. For one site, the link is to a fixed base station at the Avista office. For the other two sites, a portable base station (designed and fabricated by Electronic Data Solutions) is used. One of the monitoring sites is on a float boat in the river, and the portable base station is especially valuable because the technician no longer has to trailer a boat down a very rough road to provide access to the site. The technician simply parks near the river bank, plugs the base station into the power point in the dashboard, and collects the data.